Timothee LaRouche is a Breton pirate who currently resides in Anvil while The Serpent's Wake, the ship on which he is employed, is being refitted. He resides at the infamous boarding house The Fo'c's'le, and sleeps in the southernmost room every night between 2am and 8am. After waking up, he starts his daily routine, which includes random visits to either the dining area of The Fo'c's'le or The Flowing Bowl. While visiting the latter, he will either socialize with the other regulars or sit down and eat. On rainy days, he will keep doing this routine all day long, but if the weather is dry, he will make a few visits to the main part of Anvil: At noon, he can be found wandering around the plaza near the Dock Gate for four hours - and at 8pm, he once again enters Anvil for four hours, this time visiting destinations all over town. If it starts to rain he will immediately head back to his regular routine on the dockside. 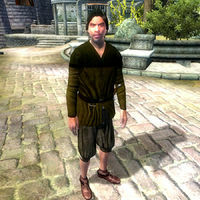 He wears a set of common lower-class clothing, a dark green shirt with breeches and a pair of stitched leather shoes. In combat, he relies on an iron dagger. He carries the key to the Fo'c's'le and a small amount of gold. Compared to the other pirates on the dockside, Timothee appears to be overly polite and peaceful. When you approach him, he will introduce himself: "Timothee LaRouche, late of the Black Dog, able seaman. I'll be staying ashore 'til my stash runs out, then it's off to sea once more." When you ask him about the town of Anvil, he will provide some background information and comment on Anvil compared to other cities: "I've gone aground in ports all over the Abecean Sea, and Anvil's far from the worst. Got the Fo'c's'le for my hammock, and Mirabelle to keep it warm." He will also give his opinion on Thurindil's eccentric behavior should you ask about him: "Must have been knocked on the head. Talks all sorts of rot. Meek as a sheep, though." As his dialogue suggests, Timothee was supposed to receive nightly visits from promiscuous innkeeper Mirabelle Monet. Unfortunately, every time Mirabelle enters his room, she turns around and picks another sailor. This appears to be due to an engine bug in determining where to sleep once she arrives at Timothee's location, although the exact nature of the bug is unclear. Esta página foi modificada pela última vez à(s) 05h50min de 20 de outubro de 2015.